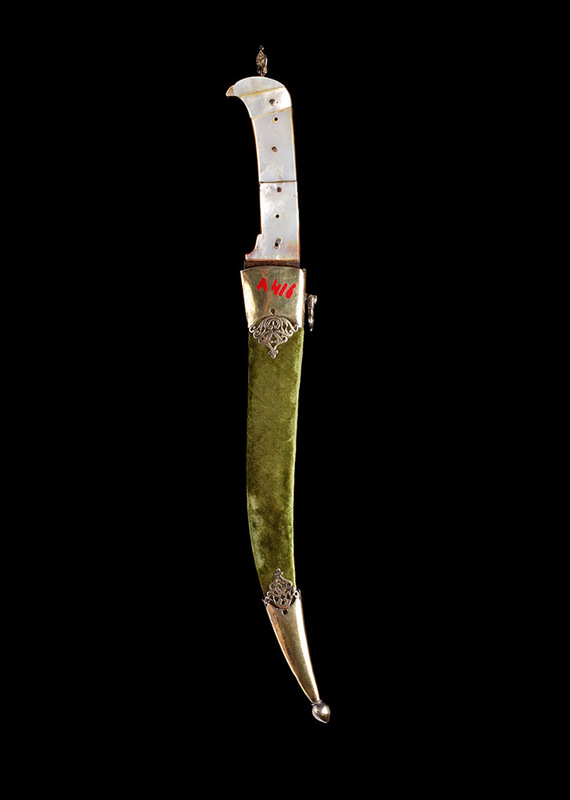 This elegant dagger is made in the general style of a pesh kabz and boasts a blade made of wootz steel-the beautiful swirling patterns clearly visible. The flat-sided grip scales are made from mother of pearl, two sections to each side, and secured to the dagger's tang by means of a series of metal pins. They provide a gentle lustrous counterpoint to the dagger's intended martial use. A small pendant, it too is inlaid with gold, is attached to the pommel's small ring: these are often lost. The corresponding wooden scabbard is covered in green velvet and mounted with an ornately finished gilt-copper mouthpiece that retains its suspension ring, and a chape that ends with a finial. Provenance: from the collection of the late Leo S.Figiel M.D. a renowned collector of Indian Arms and Armour. Cette élégante dague, réalisée dans le style d’un pesh-kabz, peut se vanter de posséder une lame en acier wootz – ses beaux motifs ondulants étant clairement visibles. Chacune des deux moitiés aplaties de la poignée se composent de deux pièces de nacre, maintenues à la soie de la dague par une série de rivets métalliques. La nacre offre un doux et chatoyant contrepoint au but martial originel de cette dague. A small pendant, also inlaid with gold, is attached to the ring of the pommel: such pendants are rarely preserved. The corresponding wooden sheath is covered with a green velvet and trimmed with a gold-plated copper panel retaining its suspension ring, as well as a snap ending in a button. Provenance: from the collection of the late Leo S. Figiel MD, a famous collector of Indian weapons and armor.